Michelangelo's painting of the creation of the Sun and Moon. Young Earth Creationism, sometimes abbreviated YEC, is a form of creationism which holds that the earth and the universe are approximately 6,000 years old. Young earth creationists hold that both creation and the evolutionary position are at root tied to worldviews, and because they are both claims about historical (or prehistorical) events, they depend on untestable assumptions. At the same time, young earth creation scientists argue that the young universe view is the explanation that best fits the evidence. Scientists who advocate an old earth regard young earth creationism as being unscientific. But the predominantly atheistic scientists rely on a double standard that ignores numerous counterexamples to an Old Earth, and the believers in an Old Earth also over-rely on flawed radiometric dating. Creation took place over a period of six ordinary (solar/24-hour) days, with God then "resting" on the seventh day. This creation, described in Genesis as "good" and "very good", was without flaw or defect. All people are descended from the first couple, Adam and Eve. Adam and Eve sinned, leading to their expulsion from the Garden of Eden. A global Noachian flood occurred, destroying all land-based, air-breathing life, except that on the Ark. The dispersal of humanity was caused by God after the Tower of Babel. Young earth creationism holds that the scientific evidence is unreasonably interpreted by evolutionists and atheists/naturalists as supporting their point of view, but that the same evidence can be reasonably interpreted by creationists to support the creationary point of view. This imposes a heavy burden on the testability of both theories, which is one of the reasons why some scientists question whether either the creationary or evolutionary view is scientific. They further argue that the scientific evidence is more consistent with the creationary point of view than the evolutionary point of view. Critics argue, however, that none of the YEC beliefs are subject to the scientific method, but the same criticism applies to theories promoted by evolutionists. The scientific method includes the process of making predictions based on your starting hypothesis and then performing experiments to verify those predictions, all in a manner that can be reproduced and validated by a peer review process. The first law of thermodynamics and second law of thermodynamics argue against an eternal universe, and these laws point to the universe being created by God. The theory of evolution is at odds with scientific evidence. Evolutionists often cite secular scientific sources which agree with them on various points (for further details please see: theory of evolution and creationism). Both evolutionary scientists and young earth creation scientists believe that speciation occurs; however, young earth creation scientists state that speciation generally occurs at a much faster rate than evolutionary scientists believe is the case. Many young earth creationists (including those at Creation Ministries International and CreationWiki) assert that the Bible contains knowledge that shows an understanding of scientific knowledge beyond that believed to exist at the time the Bible was composed. The facts 1) that so many cultures and people record a history of a great flood and 2) that geological evidence of a flood exists in almost every area of the earth, show that it is very likely, if not proven that the great flood did take place. The fact that history only spans a few thousand years evidences a young Earth. If the Earth were millions of years old, then so would civilization be. This is obviously not the case as recorded history only spans a few thousand years and our level of technology would be much more advanced. Historical-grammatical exegesis involves a systematic approach to analyzing in detail the historical situation, events and circumstances surrounding the text, and the semantics and syntactical relationships of the words which comprise the text. For more than a century, the majority of conservative Old Testament scholars no longer accepted the chronological implications of the Genesis "chrono-genealogies" following the accommodation of the old Princeton Theology (“Primeval Chronology,” Bibliotheca Sacra 47 (1890): 285-303). However, Jeremy Sexton reexamined this hypothesis in 2015  starting the process of returning Old Testament Scholarship to the consensus that held sway since before the coming of Christ (Earth age opinions of prominent Christians - pre-1800‎). Young earth creation scientists advance a number of reasons for the earth and universe being approximately 6,000 years old. They argue that the evolutionary geological timescale is in error, and that geology further provides multiple lines of evidence that the earth is young. Rejecting the uniformitarian assumptions of secular geologists, they use a geological system that depends more on catastrophism and point out that catastrophism is being increasingly accepted in the field of geology. The majestic spiral galaxy NGC 4414, imaged by the Hubble Space Telescope in 1995. Dr. Walt Brown provides numerous citations to the secular science literature that corroborate the failings of current old universe paradigm explanations in regards to the planets, stars, and galaxies. The Institute for Creation Research has a notable essay by David Coppedge entitled "Mature at Birth: Universe Discredits Evolution" which cites recent findings which challenge an old universe paradigm. In addition, Henry Morris has an essay regarding the subject of the failings of the old universe paradigm entitled "What Astronomers Don't Know". For a more detailed treatment, see Starlight problem. Anti-creationists often claim that starlight from millions of light years away demonstrates that the Biblical timescale of 6,000 years is in error, as insufficient time has passed for the light from distant stars to reach Earth. Creationists respond in part by pointing out that the popular Big Bang theory has its own star light-travel time problem (the horizon problem), citing the work of Dr. Charles W. Misner. Secondly, creationists have proposed a number of explanations for the objection, and although none are yet certain, they claim that it shows that the critics' claims that it cannot be explained are unfounded. One early explanation was that of creationist Barry Setterfield, who proposed that the speed of light was faster in the past. Critics objected to Setterfield's proposal, including on the grounds that the constancy of the speed of light is one of science's most fundamental laws. Yet in 1999, John Webb, a professor at the University of New South Wales in Sydney, Australia, and his colleagues reported astronomical observations suggesting that the value of the fine-structure constant (which is related to the speed of light) may have changed (although the size of the change was much smaller than proposed by Setterfield). They subsequently published this in 2001 in Physical Review Letters. However, other problems with the proposal has led most creationists to abandon the idea. Creationary physicist Dr. Russell Humphreys proposed a model based on Einstein's law of relativity (as the Big Bang model is), but with a different starting assumption, a bounded universe. Humphreys's model proposes that God created the universe much smaller than it is now, then expanded it, quoting the Bible saying that God "stretched out the heavens". In such a scenario, time would pass at different rates on Earth and in outer parts of the universe, so that while 6,000 years went by on Earth, billions of years passed on the outer edge of the universe. This model is also based on the Genesis account recording the days of creation according to time on Earth, rather than elsewhere. However, this theory is not without problems. The evidence contradicts Humphrey's assumption that the earth is in a large gravity well. If the earth were in such a gravity well, light from distant galaxies should be blue-shifted. Instead, it is red-shifted. Also, gravitational time dilation, if it existed on such a large scale, should be easily observable. On the contrary, we observe (from the periods of Cepheid variable stars, from orbital rates of binary stars, from supernova extinction rates, from light frequencies, etc.) that such time dilation is minor. It is thought that there is some time dilation corresponding with Hubble's law (i.e., further objects have greater red shifts), but this is due to the well-understood expansion of the universe, and it is not nearly extreme enough to fit more than ten billion years into less than 10,000. Young earth creationist scientist Dr. John Hartnett proposes a model similar to Humphreys, wherein the Earth was trapped in a time-dilation field caused by extremely strong gravitation during the first few days of creation, from Earth's point of view, while billions of years passed for the rest of the universe. He attributes the field, its removal and the continued balance in our solar system (after the field was removed) to divine intervention. Whilst Humphreys' model has time dilation caused only by gravity (per Einstein's General Theory of Relativity), Hartnett's model also takes into account time dilation caused by motion (God's expansion of the universe) (per Einstein's Special Theory of Relativity). According to young-Earth creationists, God separately created each kind of living thing, or baramin, to reproduce "after its kind". Living things had built into them a capacity for variation and adaptation, but within the limits of their kind. Genetically, in the case of sexually-reproducing species, much of this is due to the information carried on each living thing's DNA being a subset of the parent's DNA, with the subset of information being selected for by the process known as natural selection (described by a creationist before Darwin wrote about it). Mutations also play a part in this variation, but only to the extent of destroying genetic information, not creating it. Many of the ensuing variations have been classified by science as different species, but this speciation is not evolution, as it does not involve the generation of new genetic information and therefore could not have produced the evolutionary "family tree". YECs believe that most of the world's living things were wiped out by the Great Flood, but that pairs of each kind that could not survive in a flood (i.e. air-breathing, land-dwelling creatures) survived the flood on Noah's Ark, and from the Flood survivors all modern species have descended. YECs believe that most rocks were laid down in two main episodes. The first was during the creation week, particularly when God caused the waters of the Earth to gather together into the sea and dry land to appear. The second was during Noah's Flood. The effects of a global watery catastrophe would have been enormous, which would form massive amounts of erosion and sedimentation during a short period of time. Further, many young-Earth creationists believe that there was a single supercontinent prior to the Flood. This single land mass broke apart during the Flood when the subterranean waters bursted out of the subterranean chambers causing the earth to break apart (see also: Hydroplate Theory). According to many Young earth creationists, there were probably fewer oceans with much more land on the earth prior to the flood. It is believed that the worldwide water quantity increased after the flood. The sea trenches and ocean floors sunk further down after the flood waters subsided, because of the increased pressure of the water, thus causing the sea levels to rise. Young earth creationists also believe that many of the mountains, valleys, and lakes we see today were formed by the geological transformations caused by the flood. This would have further contributed to a massive reshaping of the Earth's surface. For a more detailed treatment, see Biblical anthropology. YECs believe that all intact evidence of civilisation is evidence of post-flood civilisation, as the Flood destroyed the pre-flood world. God confounded man's single language at the Tower of Babel, forcing different family groups to separate and spread around the world. Most of the people groups listed in the 'Table of Nations' in Genesis 10 , which contains a family tree of Noah's descendants, are identifiable from non-biblical records. People enduring a forced migration will find any shelter they can, and this would explain much of the evidence of "cavemen". According to the chronogenealogies in the Bible, the age of the universe and Earth is approximately 6,000 years. The old universe view is that the universe started about 14,000 million(14 billion) years ago and Earth was formed around 4,500 million(4.5 billion) years ago. The creation account has everything being created over a period of six ordinary days, whereas the old universe view has things appearing over billions of years. The order of creation is different. The creation account has the Earth before the sun, plants before the sun, and birds before land animals, among other differences. The old universe view is the opposite order for each of these. The creation account records that death didn't exist prior to the Fall, whereas the evolutionary view is that death and suffering are part of the biological process and existed for billions of years of death prior to the appearance of man. The creation account records various living things being separately created, whereas the evolutionary view has all living things being descended from the first living cell. Young Earth creationism is based on the Bible, the infallible Word of God. Christian YECs adhere strongly to the concept of biblical inerrancy, which declares the Bible to be divinely inspired and therefore scientifically infallible and non-correctable. This position is considered by devotees and critics alike to be incompatible with the principles of scientific Objectivity. The Young Earth creationist organizations Answers in Genesis (AiG) and Institute for Creation Research (ICR) require all members to pledge support for biblical inerrancy. YECs often suggest that supporters of evolution theory are primarily motivated by atheism. Critics reject this claim by pointing out that many supporters of evolutionary theory are in fact religious believers, and that major religious groups such as the Roman Catholic Church and Church of England believe that the concept of biological evolution does not imply a rejection of the scriptures. Nor do they support the specific doctrines of biblical inerrancy proposed by YEC. Critics also point out that workers in fields related to evolutionary biology are not required to sign statements of belief in evolution comparable to the biblical inerrancy pledges required by ICR and AiG. This is contrary to the popular belief of creationists that scientists operate on an a priori disbelief in biblical principles. They also discount Christian faith positions, like those of French Jesuit priest, geologist and paleontologist Pierre Teilhard de Chardin, who saw that his work with evolutionary sciences actually confirmed and inspired his faith in the cosmic Christ. Nor do they believe the views of Catholic priest Fr. Thomas Berry, a cultural historian and eco-theologian, that the cosmological 13 billion year "Universe Story" provides all faiths and all traditions a single account by which the divine has made its presence in the world. Proponents of YEC are regularly accused of quote mining, the practice of isolating passages from academic texts that appear to support their claims while deliberately excluding context and conclusions to the contrary. Some theologians oppose the proposition that God can be a legitimate or viable subject for scientific experimentation, and reject a literal interpretation of Genesis. They propose there are statements in the creation week itself which render the historical interpretation of Genesis incompatible with scientific evidence. One example is that God created the Earth and heavens, and light, on Day 1, plant life on Day 3, and the sun and moon on Day 4. One must ask where the light in Day 1 came from, and why there were plants in Day 3 if the sun, which provides all light to the Earth, did not even exist until Day 4. YECs such as Basil the Great and John Calvin answered this by suggesting that the light created by God on Day 1 was the light source. Answers in Genesis has refined this by suggesting that the Earth was already rotating with respect to this light. One can also make a case that God created the plants toward the evening of Day 3, the Sun was created on the morning of Day 4, therefore the plants only had to endure darkness for a period not much longer than a typical night. Another problem is the fact that distant galaxies can be seen. If the universe did not exist until 10,000 years ago, then light from anything farther than 10,000 light-years would not have time to reach us. Most cosmologists accept an inflation model as the likely explanation for the horizon problem. Inflationary models also account for other phenomena, and are in agreement with observations of recent microwave anisotropy satellites. Creationists have also proposed models to explain why we see distant starlight. See creationist cosmologies and the starlight problem for more information. 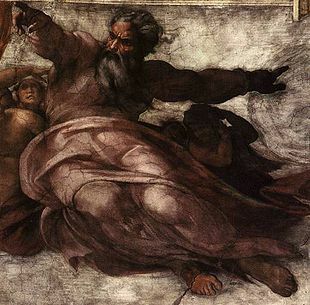 Many critics claim that Genesis itself is internally inconsistent on the question of whether man was created before the animals or after the animals as stated in Genesis. Proponents of the Documentary hypothesis suggest that Genesis 1 was a litany from the Priestly source (possibly from an early Jewish liturgy) while Genesis 2 was assembled from older Jahwist material, holding that for both stories to be a single account, Adam would have named all the animals, and God would have created Eve from his rib as a suitable mate, all within a single 24 hour period. Many creationists attribute this view to misunderstanding having arisen from poor translation of the tenses in Genesis 2 in contemporary translations of the Bible (e.g. compare "planted" and "had planted" in KJV and NIV). Some Christians assert that the Bible is free from error only in religious and moral matters, and that where scientific questions are concerned, the Bible should not be read literally. This position is held by a number of major denominations. For instance, in a publication entitled The Gift of Scripture, the Roman Catholic Church in England and Wales comments that "We should not expect to find in Scripture full scientific accuracy or complete historical precision". The Bible is held to be true in passages relating to human salvation, but "We should not expect total accuracy from the Bible in other, secular matters." By contrast, YECs contend that moral and spiritual matters in the Bible are intimately connected with its historical accuracy; in their view, the Bible stands or falls as a single indivisible block of knowledge. Aside from the theological doubts voiced by other Christians, YEC also stands in opposition to the creation mythologies of other religions (both extant and extinct). Many of these make claims regarding the origin of the universe and humanity that are completely incompatible with those of Christian creationists (and with one another). The young Earth view is just one interpretation of the Bible. The young Earth view is the clear intention of the authors of the Bible. See Creation week for more. Also, the young Earth view was the view of most of the church throughout most of its history. That has only changed in order to accommodate non-biblical views of history. Creationists read the Bible literally, whereas parts, such as the creation account, are really metaphor. Creationists deny that they read all the Bible literally, and accept that there are metaphors and other non-literal passages in the Bible. Instead, they read the Bible the way it was meant to be understood, which in the case of the creation account, is as literal history. See Biblical exegesis above and Creation week for more. Evolution has scientific evidence, and creationism does not. Both creationists and evolutionists have the same evidence. The difference is in how that evidence is interpreted. Creation relies on faith, not evidence. Both creation and evolution are faith positions based on different worldviews. Evolutionists exclude God from consideration a priori, not because of the evidence. The evidence in favor of evolution means the Earth must be much older than the 6-10 thousand years explained in creation science. It is difficult to conceive of a mechanism by which any kind of biological "dating" mechanism could remain accurate in face of the supposedly changing levels of chemicals and solar radiation that evolutionary geologists insist upon. Even the most dedicated Darwin followers in the ranks of academia have been forced to admit that Carbon-14 dating can be wildly inaccurate for several reasons, such as naturally occurring radioactive elements in the Earth's crust. This is just one area of the theory of evolution which scientists have had to back away from with much embarassment. Perhaps if scientists could adopt a more open-minded tone towards those they disagree with, they could issue retractions without such fear of retribution. If creation had scientific merit, why don't they publish their evidence in peer-reviewed scientific papers? The scientific establishment won't allow creationists to publish. See Suppression of alternatives to evolution. Some journals purport to accept material from all scientific perspectives, but engage in a process known as sham peer review. In normal peer review, papers are checked by two editors, independently, for methodological errors ONLY, not vetted for their content. That is the responsibility of the scientific public. During sham peer review, editors often collaborate to block publication of any literature that challenges established dogma, or their own pet theories. To make the problem worse, due to the incestuous nature of the mainstream journal editor pool, the same editor may serve on as many as a dozen different editorial boards, allowing them to spread their bias across a much larger area than an ethical editor would. Though this is widely acknowledged as a deceitful practice, its scope is widely downplayed in the scientific community and is actually almost openly tolerated in some areas of science. Creationists start with a preconception and try and fit the evidence to that. Evolutionists start with the evidence. Both creationists and evolutionists have their worldview as a starting point. Evolutionists try and fit the evidence into their idea just as much as they accuse the creationists of doing. Because they are based on the Bible, creationists are not willing to change their views. Evolutionists will change their views as new evidence is found. Creationists start with the Bible as the foundation of their views, but beyond that are willing to change their views as new evidence is found. Evolutionists are willing to change the details of how evolution works, but are not prepared to change their basic view that evolution did occur. Many creationists are scientists and fully support science. They never reject science itself, and the criticism is bogus. Creationism is not less falsifiable than evolution. See falsifiability of Creation and Falsifiability of evolution. Creationists want their view taught in schools, but not other creation stories. Creationists have made it clear that they only want scientific evidence consistent with creation taught. Critics have not proposed any scientific evidence for other creation stories. Leading creationists know that what they promote is wrong, so they are liars. Accusations like this are rarely backed by any evidence of systematic lying. For a more detailed treatment, see Arguments for a recent creation. The arrows point to paraconformities at the Grand Canyon. Many arguments for a recent creation have been put forward by creationary scientists, both scientific and theological arguments. Scientific arguments include radiometric dating results that disagree with secular ages, other dating methods that do not fit with secular ages, and phenomenon showing events that occurred quickly. There should be virtually no 14C present in carbon supposedly older than 100,000 years, yet it has proved impossible to find any such carbon without 14C. Dating methods don't have to be based on radioactivity. Measuring the amount of sodium in sea water, for example, and calculating how long it would take to reach those levels is another method. Yet calculations show that the amount of sodium could not have taken longer than 62 million years to accumulate, well short of the 3,000 million year supposed age of the oceans. Polystrate fossils demonstrate that many layers of sedimentary rock that are normally supposed to take a long time to form can be formed quite quickly. Young Earth Creationism is a subset of Creationism most commonly found among members of the Abrahamic religions, especially Judaism, Christianity, and Islam (for details please see: Creationism). In regards to early Judaism and early Christianity, early Judaism supported young earth creationism and a majority of the early church fathers held the young earth creationist view. According to Gallup, young Earth creationism had a clear plurality of adherents in the United States until 2017, and even then it still comprised a large minority of the U.S. population. Some of the more notable young earth creationist organizations include: Answers in Genesis (America and the United Kingdom), Creation Ministries International (Australia, Canada, New Zealand, Singapore, South Africa, U.S.A., and United Kingdom), Institute for Creation Research (U.S.A.), Creation Research Society (U.S.A.), and NorthWest Creation Network (Washington state, U.S.A.) which founded CreationWiki. Creation Ministries International publishes a 56-page color magazine, Creation magazine, with no paid advertising, which is distributed to 140 countries. The Institute for Creation Research publishes a free monthly magazine, Acts & Facts, which includes news of the organization and articles. Answers in Genesis, which previously distributed Creation, began their own magazine, Answers, in 2006. It contains advertising and its target audience is primarily American. The Creation Research Society Quarterly is published quarterly by the Creation Research Society, and the Journal of Creation is published three times a year by Creation Ministries International. R.L. Wysong, The Creation-Evolution Controversy. Jeanson, Nathaniel T. (2017). Replacing Darwin: The New Origin of Species. Green Forest, Arkansas: Master Books. ISBN: 9781683440758. Mortenson, Terry, ed. (2016). Searching for Adam: Genesis & the Truth About Man's Origin. Green Forest, Arkansas: Master Books. ISBN: 9780890519752. Boyd, Steven W.; Snelling, Andrew A. Grappling with the Chronology of the Genesis Flood: Navigating the Flow of Time in Biblical Narrative. Green Forest, Arkansas: Master Books. ISBN: 9780890517093. Snelling, Andrew A. (2010). Earth’s Catastrophic Past: Geology, Creation & the Flood. Green Forest, Arkansas: Master Books. ISBN: 9780890518748. The Problem of Evolution Facts and theories of biological evolution. What Is the Most Compelling Scientific Evidence of a Young Earth?, by Dr. Terry Mortenson at Answers in Genesis. Originally published on February 27, 2006. Seven Reasons Why We Should Not Accept Millions of Years by Dr. Terry Mortenson at Answers in Genesis. Originally published on July 17, 2006. ↑ "YEC", can refer to Young Earth Creationist or Young Earth Creationism. "YECs" refers to Young Earth Creationists. ↑ Sarfati, 1999, Chapter 8, How old is the earth?. ↑ Sarfati, 1999, Chapter 7, Astronomy of Refuting Evolution. ↑ Is there any reference to the confusion of languages at Babel in early Mesopotamian literature? (ChristianAnswers.Net). ↑ Is there archaeological evidence of the Tower of Babel? (ChristianAnswers.Net). ↑ Jackson, Wayne, The Tower of Babel—Legend or History? December 17, 1999 (Christian Courier). ↑ Days of Creation (CreationWiki). ↑ Genesis Questions and Answers (Answers in Genesis). ↑ Niessen, Richard, Theistic Evolution and the Day-Age Theory Impact 81, March 1980. ↑ Kulikovsky, Andrew S., Fostering fallacy Journal of Creation 16(2) 2002, p.31-36. ↑ Kulikovsky, Andrew S., The Bible and hermeneutics Journal of Creation 19(3):14–20, December 2005, p.14-20. ↑ : "Who Was Born When Enosh Was 90? : A Semantic Reevaluation of William Henry Green's Chronological Gaps." The Westminster Theological Journal 77, no. 2 (September 2015): 193-218. ↑ 22.0 22.1 Astronomy and Astrophysics Questions and Answers (Answers in Genesis). ↑ Brown, 1991, Astronomical and Physical Sciences; Sarfati, 1999, Chapter 7. ↑ Scott Tremaine, as quoted by Richard A. Kerr, “Jupiters Like Our Own Await Planet Hunters,” Science, Vol. 295, 25 January 2002, p. 605, quoted by Brown, 2001, notes for chapter 43. ↑ Stephen G. Brush, A History of Modern Planetary Physics, Vol. 3 (Cambridge, UK: Cambridge University Press, 1996, p. 91, quoted by Brown, 2001, notes for chapter 43). ↑ Michael Rowan-Robinson, “Review of the Accidental Universe,” New Scientist, Vol. 97, 20 January 1983, p. 186, quoted by Brown, 1991, Notes for chapter 62. ↑ Lisle, Jason, Light-travel time: a problem for the big bang, Creation 25(4):48–49, September 2003. ↑ Wieland, Carl, Speed of light slowing down after all?, Journal of Creation 16(3):7–10, December 2002. ↑ 53.0 53.1 Sarfati, Jonathan, Have fundamental constants changed, and what would it prove?, 22nd August, 2001. ↑ For example, CMI and AiG say that this is an idea that should not be used. ↑ Conner, S. R. and D. N. Page, 1998. Starlight and time is the Big Bang. CENTJ 12(2): 174-194. (See also letters in CENTJ 13(1), 1999, 49-52). ↑ Hartnett, John G., A new cosmology: solution to the starlight travel time problem Journal of Creation 17(2):98–102, August 2003. ↑ How could the days of Genesis 1 be literal before the sun was created? ↑ Gledhill, Ruth. "Catholic Church no longer swears by truth of the Bible", The Times, 2005-10-05. ↑ Leeming, D.A. ; Leeming, M.A. (1996). A Dictionary of Creation Myths. Oxford Paperbacks. ISBN 0195102754. James-Griffiths, James,Creation days and Orthodox Jewish tradition Creation 26(2):53–55, March 2004. ↑ Swift, Art (May 22, 2017). In US, Belief in Creationist View of Humans at New Low. Gallup. Retrieved June 6, 2017. This page has been accessed 265,966 times.